Ober-Flörsheim, a village between Alzey and Monsheim, Rheinland-Pfalz, Germany (coordinates: 49° 40′ 59″ N, 8° 9′ 19″ E). As early as 1664 the Mennonite lists in the Karlsruhe archives name four Mennonite families in this village, and in 1685 the families of Peter Weber, Peter Mundorf, Peter Dahlem, Johann Dahlem, Johann Horbach, and Dietrich Schwarz are listed with 42 persons. In 1738 the families of Arnold Kramer, Johann Hahn, and Johannes Schmidt were added. In 1732 the congregation numbered 13 families; the preacher was Christian Weber, the deacons Johann Dahlem and Heinrich Rupp; the latter lived in Gundersheim. Members of the congregation also lived in Monzernheim and Dahlsheim. Here the families of Jakob Heer, Johann Geber, Abraham Müller, Johannes Nold, and Abraham Kolb are named in 1743. The Dutch [[Naamlijst der tegenwoordig in dienst zijnde predikanten der Mennoniten in de Vereenigde Nederlanden|Naamlijst]] names Christian Weber as a preacher here from 1725 and elder 1728-ca. 1775. Other ministers were Jacob Dalman (Dahlem), elder 1740-?, Wilhelm Kramer (Krämer) 1748-ca. 1780, Johann Schörger, Heinrich Müller 1759-?, Henrich Strohm, Peter Müller, Jacob Hahn, Jilles (?) Hahn 1772, Wilhelm Weber 1775, Peter Krämer 1775. In 1766 the [[Naamlijst der tegenwoordig in dienst zijnde predikanten der Mennoniten in de Vereenigde Nederlanden|Naamlijst]] calls this congregation Oberflörsheim-Spiesheim-Griesheim, in 1769-1782 Oberflörsheim and Guntersheim, and from 1784 Oberflörsheim. In 1769 the Oberflörsheim-Spiessheim congregation had about 100 members. The list of 1752 gives particulars concerning the families and financial resources of the Mennonites of Oberflörsheim. It lists six families: Jakob Dahlem with six children, Jakob Hahn with seven, Wilhelm Kramer with four, Johannes Schmitt with five, Christian Weber with four, and Peter Weber with four children, a total of 42 persons, with a total capital of 12,000 florins. In 1737 the following incident of religious intolerance is recorded: Dietrich Weber married a Catholic servant girl; the children were brought up in the Mennonite faith. The oldest was baptized as an adult. Then the Catholic clergy compelled the children to become Catholic. The father was compelled to join one of the three recognized churches. All pleas and petitions of the father and the congregation were in vain. The father finally joined the Reformed Church. The Danzig Namensverzeichnis of 1805 lists Johann Galle as the elder of the congregation from 1766 until his death in 1838 (he had left Monzernheim in 1803), Philip Weber and Peter Krämer as leaders from 1775. The Danzig Namensverzeichnis of 1857 names only Jakob Krämer as leader. It states further that preaching services were alternately conducted by Löwenberg of the Weierhof and Molenaar of Monsheim; the latter soon took charge alone until 1866, when the congregation was dissolved. The inhabitants of the village joined the Monsheim congregation. The cemetery was sold. In 1957 there were four Mennonite families and four part families living in the village, and the burgomaster was a Mennonite named Stauffer. Hege, Christian and Christian Neff. Mennonitisches Lexikon, 4 vols. Frankfurt & Weierhof: Hege; Karlsruhe: Schneider, 1913-1967: v. III, 283 f.
Hoop Scheffer, Jacob Gijsbert de. Inventaris der Archiefstukken berustende bij de Vereenigde Doopsgezinde Gemeente to Amsterdam, 2 vols. Amsterdam: Uitgegeven en ten geschenke aangeboden door den Kerkeraad dier Gemeente, 1883-1884: v. I, No. 1472. Der Mennonit IX (1956): No. 11, p. 170. Müller, Ernst. Geschichte der Bernischen Täufer. Frauenfeld: Huber, 1895. Reprinted Nieuwkoop : B. de Graaf, 1972: 211. Naamlijst der tegenwoordig in dienst zijnde predikanten der Mennoniten in de vereenigde Nederlanden. Amsterdam, 1731, 1743, 1755, 1757, 1766, 1769, 1775, 1780, 1782, 1784, 1786, 1787, 1789, 1791, 1793, 1802, 1804, 1806, 1808, 1810, 1815, 1829. Neff, Christian and Nannes van der Zijpp. "Ober-Flörsheim (Rheinland-Pfalz, Germany)." Global Anabaptist Mennonite Encyclopedia Online. 1959. Web. 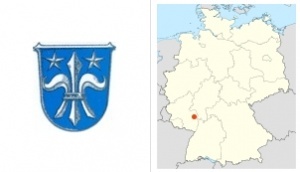 25 Apr 2019. http://gameo.org/index.php?title=Ober-Fl%C3%B6rsheim_(Rheinland-Pfalz,_Germany)&oldid=144510. Neff, Christian and Nannes van der Zijpp. (1959). Ober-Flörsheim (Rheinland-Pfalz, Germany). Global Anabaptist Mennonite Encyclopedia Online. Retrieved 25 April 2019, from http://gameo.org/index.php?title=Ober-Fl%C3%B6rsheim_(Rheinland-Pfalz,_Germany)&oldid=144510. Adapted by permission of Herald Press, Harrisonburg, Virginia, from Mennonite Encyclopedia, Vol. 4, pp. 11-12. All rights reserved.